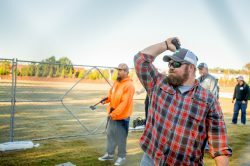 Outdoor Axe Throwing in Atlanta with Bad Axe Throwing! It all started as an outdoor past time with Canadians having fun in their backyards. 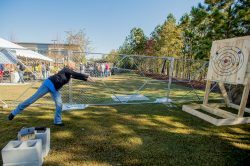 In Atlanta, we’ve brought axe throwing back to the outdoors! When Reeves Young asked us to throw axes outdoors we were stoked to be a part of getting back to the Axe Throwing roots! Even though we’re new to Atlanta, but with the ecstatic welcome we received from the community, we are certain we chose the right place! 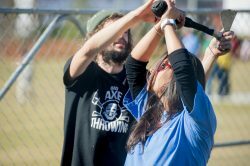 Outdoor Axe Throwing is perfect for fall weather! We know Atlantans are the kind of people who want something unique and totally different—a way to let loose and blow off steam from the work week. We can guarantee axe throwing is unlike any activity you’ve done with your friends, family or colleagues. The fine folk at Reeves Young got a taste of what we’re about, and felt the thrill of releasing a steel blade from their hands. You too can call on Bad Axe Throwing to host your next corporate team building event! Unlike golf, axe throwing doesn’t require nice weather—in fact, your team can enjoy it all season long. But it sure is nice to throw axes win the sun! No need for white pants and sweater vests. We only recommend plaid and comfortable clothing to show off (or develop) your target-hitting skills. Aside from sharpening your team, you can also impress your clients with an unforgettable experience. You’re sure to make a positive impression by taking them to a cool and relaxing place that’s exceptionally different with the right kind of personality: fresh, innovative and even risk-taking (you are throwing steel blades after all). Atlanta isn’t our first outdoor event either! We were able to attend the Richmond Hill Rib Fest in Vaughan this past summer. One of our awesome coaches even won the rib eating contest! Showing that we not only know how to throw axes like champs, but eat like champs too! Sadly, we have a few months of winter to go through until axe throwing comes back out to play. But while we wait we still have our warm indoor locations all over the US and Canada! If you’re interested in hosting an outdoor event, whether it’s a corporate event, wedding, b-day party or any other occassion, please contact us and we’ll hook it up. Make sure to follow us on Instagram and Facebook to see awesome throws, goofy group shots, and epic fails! It will be sure to make winter go by quickly so we can get back outside! CBC Radio-Canada goes Axe Throwing in Ottawa!